11 Bold and Hilarious CVs and Job Applications looks at the people who dared to be different – verydifferent, in their CVs and job applications! Let’s face it: CVs and job applications are hardly the most inspiring of documents. And they’re even less exciting when you have to spend hour upon boring hour on the soulless task of creating them or filling them in. That’s why these savvy job seekers broke with the norm and decided to revolutionise the CV. Whether they scrapped the traditional A4 format and went for something visually different, or decided that honesty was the best policy, these CVs are hilarious – and might have bagged some of their creators new careers. It’s not just job hunters who get bored by CVs; the employers who have to read through stacks of them start to switch off too. These show-stopping CVs will have been sure to grab the attention of complacent recruiters, as well as going viral and making us smile. 1. STEALING GINGER BISCUITS AND PRETENDING TO BE DARTH VADER. Jobless Benedict le Gauche was so fed up of receiving rejection letters that he took matters into his own hands and wrote a brutally honest CV. Instead of droning on in the usual job-hungry jargon, le Gauche told it how it was. 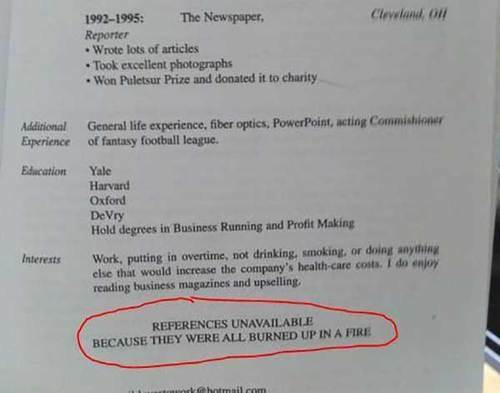 After mailing his extremely truthful CV out to numerous employers, he recorded their responses on his blog, which quickly shot to online prominence. It’s not clear what happened after that, but one can only assume he went on to secure a job utilising his wit and writing skills. Read it and weep. With laughter. You’re left wondering whether Eric actually wanted a job, but his absurd comparisons to horses and cats and his use of a terrible pun make you think that someone out there, somewhere, must have ‘got’ him and given him a chance. You’d hope so, anyway. As well as being lucky enough to have a name that sounds like a brand new genre of dance music, Phil Dub had the nous to put himself online in the style of an Amazon product listing. If you want a proper laugh, head to his page at phildub.com and see what happens when you click the ‘Wedding Registry’ button. Presumably he’s been snapped up by now, by an employer, if not a spouse. 4. THE DOG ATE THEM…. You’ve got to hand it to the author of this totally open ‘job wanted’ ad. Who wouldn’t want to hire a ‘Former Marijuana Smuggler’ when they list an ‘incident-free ten year prison sentence’ and ‘executive level management in a successful pot-smuggling venture’ amongst their achievements. Other impressive traits include the fact that the writer is personable, well educated, clean, reliable and sober. And honest: very, very honest. For that, we hope they got a job. Ever get that feeling of dread and stupidity when you’ve sent a professional email and forgotten to include the attachment? Don’t worry: it’s happened to us all – and now you can feel better. Spare a thought for Vanessa, who applied for a summer job at a university and somehow managed to attach to the email a deranged head-shot of Nicholas Cage instead of her CV and covering letter. Don’t worry, Vanessa, we all have crazy Cage photos saved to our hard drive. Easy mistake to make. If you really want to impress your prospective employer, you need to keep the language on your application or CV extremely professional at all times. Try to be formal, check all spelling and grammar and (hopefully) obviously do not swear. Also, the colour you’re looking for is taupe; a toupe has an accent on it and is basically a wig. “I am a popular guy but also a loner”. Who knew you could squeeze an oxymoron into a boring old job application? After a ‘couple of drinks’ this job-seeker transforms into ‘a right ladies’ man’. No wonderhe’s using the same techniques he uses to ‘sell himself’ to girls to ‘sell himself’ to employees. Greg Mulmash goes all out on this application to one of the world’s best-known fast food restaurant chains. He can work six hours per week, left his last job because ‘it sucked’ and smokes not on the job but on his breaks. We’ll have a burger and fries with a large Diet Coke please, Greg. Oh, goodness this is adorable: little Sam was so in love with England’s National Railway Museum that he applied for the position of Museum Director with this extremely sweet letter, in which he boasts the ability to control TWO of his toy trains at once (WOW). What’s cuter than the job application? The fact that the museum went on to offer him the unique position of ‘Director of Fun’ – and set up thecute suit photo shoot you’ll see below.. Unemployed Irishman FÃ©ilim Mac An Iomaire didn’t want to become a statistic at a time when thousands of people were leaving his native country to find work. He spent his last 2000 Euros on this billboard: an evocative image of his silhouette facing world-famous landmarks, including the Statue of Liberty. It paid off: after a media storm, he was offered a job in PR for betting firm Paddy Power. A good gamble, then.